Added entry for Color. Decided the scientific color theory is not as immediately interesting for picking colors in art as a theory based first on human emotions and human observers, human perception is. The scientific color theory (wavelengths, etc.) works independent from human perception and does not attribute human emotional interpretations to colors. The video linked to below (51m15s) documents where the idea of light/darkness, warmth/cold as perceptual, emotional attributes to some ranges of color came from. different depending on the depth of the fluid. properties of light and warmth. properties of darkness and cold. independent of a human observer. edit: Also added "further reading" links to some of the already finished entries. I think warm/cold are descriptive words for a type of sensation/feeling. Color corresponds to wavelengths of light, and the wavelengths are more or less intense for blue verses red, etc.. blue bounces more easily than red, so red feels more intense because it hits more directly. It may not be warm in temperature sense, but using that terminology is a way of translating the sense into something understandable I guess. There might be a better word for it? Maybe terms could be "emotional color temperature" and "scientific color temperature". I understood Goethe's observations as mood/emotion based, at least from what was shown in the video I linked (have not read his book on it). As I understand it, it's an emotional color system, concerned with human perception and interpretation of color, attributing human emotions to colors. How a color is produced from primaries is not what the "yellow and blue form the basis" is about. I believe when he placed yellow(light in the sense of "not heavy or bright/cheerful" not as in light source) and blue (darkness in the sense of "heavy mood") as the "basis" he did not mean as the basis to mix colors but as the basis to establish two opposites in human emotion. I might need to read his book. Color Mixing from primaries will be explained in a different entry. There are neutral colors though (green and magenta), which arise when a warm and cool color blend/cross. 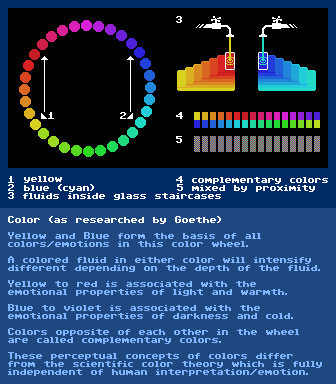 Goethe's color theory is really great, and focuses around the idea that color emerges from the boundary of light and dark. If you hold up a pinhole to your eye and look at for example the edges of a window or something where light/dark creates a sharp edge(using sunlight).. You will see the edge have either a red/yellow band or a blue/cyan band. The colors you see are due to the crossing/bending of light/dark. It isn't just simply light. That's my understanding of it. Yes, I believe he establishes it around the observations that if there is only 100% light, there is no color, if there is only 100% darkness, there is no color either. Color emerges where light and dark are "mixed" according to what he saw. Then an attribution is made. Yellow is assigned to light but also to "light" in the emotional/mood sense. Similar double attribution is made to blue for darkness. So... well, light and dark form the basis for his color wheel really. edit: One could probably go as far as calling light and darkness "emotional primaries" or primary emotions. Other emotions are mixtures of those. I think when speaking in terms of color, and judging whether a color is warm or cold, you have to take into consideration the totality of what warm/cold colors are, and that requires looking at the whole spectrum. If you are judging two yellows and saying one is cooler and the other is warmer, I think it could also be said that one is less warm and the other is more warm. What you're really determining, though, is how much light/dark there is in the color (from the perspective of light versus lack of light; space). If you look at the dynamic of color, a warm color will have half in the lighter side and half in the darker side. The lighter half is yellow, and the darker half is red. The same dynamic is present in the cool color; You have half in the lighter side (cyan), and half in the darker side (blue). When dark crosses with dark, you get magenta. When light crosses with light, you get green. So a greenish-yellow would more of a Neutral Light Color. A magenta-red would be more of a Neutral Dark Color. A yellow-red would be a Warm Color that is between light/dark. A cyan-blue would be a Cool Color between light/dark. Color blends are basically different percentages of the dark/light sides, or the warm/cold sides. So there is a Light/Dark color and a Warm/Cold color. They cross with each other to produce the full spectrum. When warm crosses with cold, you get neutral light or dark colors. When you cross light or dark colors, you get neutral warm or cool colors. That is how I consider color, and the theory I follow. I don't know if Goethe's theory classifies things in this manner, but I feel how I've defined it is the best way if you want to look at color as being warm/cold.